Do you feel a call to return to the Blessed Mother? Is She calling You? Do you desire to connect more deeply to Her essence? To hear Her messages for You? To feel Her Presence within You? Do you feel drawn to images of Her and long to paint Her for yourself? Bring one focus of healing to Her to transform and transmute. Invite miracles, release and healing that only comes through the Feminine. Study Her Story and Prophecy through Wisdom Sophia. Experience the power of Her Grace and learn how to access Grace in your everyday. Discover and deepen in your Creative and Spiritual Practices. Experience the sacred through Rituals of Chant and Dance devoted to prayer. Learn to connect to Her through the cycles of the Moon. Create and walk the Medicine Wheel, and access Her through the 4 directions. Create a Spiritual Practice using your painting, the moon and rituals of grace. Gather in Sacred Circle with women exploring their relationship with the Great Lady. Connect with Her Great Mother essence, and learn to access & feel it for yourself. $1700 – Includes All Materials, Rituals and Feasts – and special 3-payment plan is available. PLUS! A sacred adventure in Wine Country! Lodging is arranged individually. We’ve made special arrangements with B&B’s within walking distance. Upon registration we will provide you with the information to reserve your own accommodations. REGISTER to SAVE your place in the Circle. We are calling you in! Do you hear us calling in your heart? 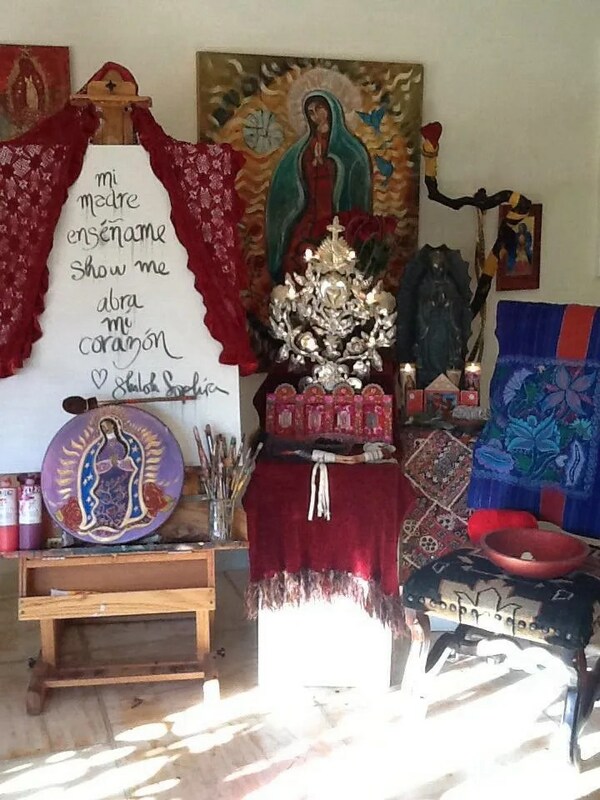 This retreat is a very special sacred invitation: An intimate circle — We will gather with up to 13 women at Shiloh’s personal home/sanctuary/studio, under the sun and stars of the Valley of the Moon in Northern California – the first retreat on her property, which is blessed with a sacred Mother Mary grotto under a cathedral of a redwood trees, creating a beautiful outdoor sanctuary where we will paint, heal, share meals and gather in sacred red thread circle. Lady Lodge – Lodge is the name used in Native American Tradition (Earth Lodge, Sweat Lodge, Moon Lodge) to denote a ‘space’ for gathering that often has specific intentions that happen INSIDE that space. We will gather in ceremony with the intention to connect and commune more deeply to Her, to be embraced more fully in the Grace of the one known as the Great Lady, allowing us to heal and feel more deeply in the arms of The Great Mother. Divine Dining & Sacred Adventures – We will also have the gift of cuisine prepared specifically FOR US by our very own private Chef, Jonathan Lewis. Very healthy but also luxurious. Jonathan has served with top restaurants such as Lutece’, Charlie Trotters and Commanders Palace. Our meals will be farm to table and all sourced within our own local area. We will also have an afternoon picnic and wine tasting since we live inside of one of the world’s most famous vineyard regions. Retreat investment is $1700. Take advantage of our 3-pay option ($566 due upon registration and pay the rest later). If this retreat is calling you, and you are a YES, then the next step is to CLICK HERE to register and reserve your place in our circle. If you have further questions or would like to confirm this retreat is the right fit for you, our retreat coordinator is happy to talk with you. Just send Sarah a message at sarah@shilohsophiastudios.com. Will you pretend you are sitting and having tea with us right now? That we are talking about the things that matter, to you and to us as women. And as often happens with women, in-between giggles, tears and epiphanies – our conversation turns to the ‘Feminine’, both in the context of the status of women in this world and regarding… Our Mother. We want to ask you a few questions…listen from your heart. Do you sometimes feel the voice of the Holy Mother calling to you from dreams or as if from a voice in your heart? 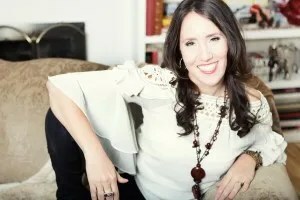 Do you wonder how you can deepen your sweet connection to the Feminine in Her multi-faceted beauty, abundance and wisdom? Do you feel burdened by the suffering of the world and struggle to navigate keeping your own peace in the chaos? Do you long for a creative spiritual practice that will truly connect you to the flow of the Divine, because you know you cannot do this alone? For each of us, She may appear different, as varied as we humans are. In the case of the Madonna, she appears as we appear to ourselves. What do we mean by that? Since the beginning of ‘creating’ – of art – humans have been creating images of the feminine in their own image. For me Shiloh, since I work with, and for, the Virgin and study Her patterns and live under the mantle of Her blessings, it is Her I seek to serve. For me Christine, I am clear that my deepest and most profound healing’s have come at the ‘hands’ of the divine feminine, what I would call the Great Mother. The Blessed Mother has appeared around the world in different times and lands for close to 2,000 years and guess what – she shows up in the custom of the people of that geography – perhaps she will appear to us in our own hearts! 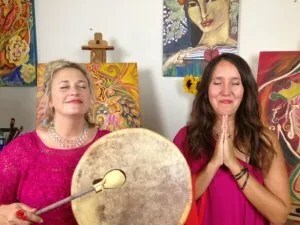 And we both have experienced in our own sacred journeys and those of many of the women that we’ve worked with, that there are just some things that can only be healed through the embrace and Grace of Her… and this requires an actual experience with her, which often only painting, prayer and ritual can bring to you. When we were praying and asking what wanted to happen this Spring in our friendship and our work together, she wanted us to call this Spring Retreat: LADY LODGE. A space for us to gather around OUR Great LADY. 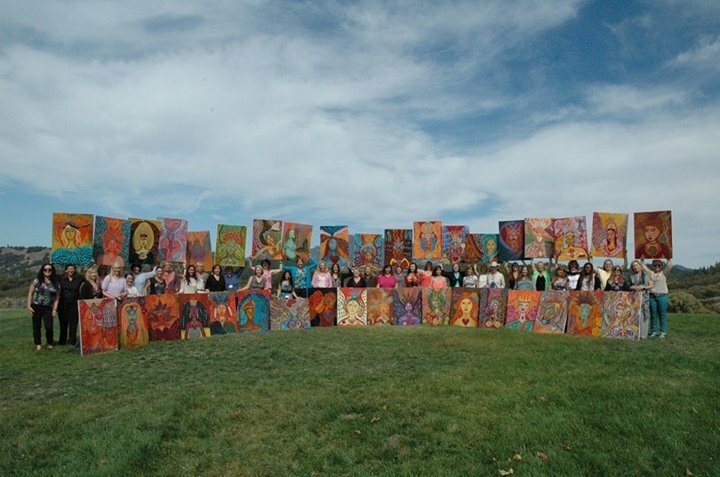 In addition to painting at our easels outside, dining on delicious food, we will also walk the sacred Native earth on the Mountains, and sit under the stars at night on blankets – really connecting with the EARTH and Her medicine for us. We will also attend Shiloh’s church, which holds an icon Mary holding the red thread sacred on Sunday (should you choose to) and explore our relationship to Our Lady in a tradition that is over 1000 years old. IF you are feeling called, and think this is FOR YOU and you have been waiting for this, then save your spot after you read the rest of this letter so you know all the specifics you need to know, as this is not for everyone. Many of us are still healing our relationship to the feminine, and if you are not feeling ready for that sacred work then this might not be right for you. How is your cup of tea? We love sitting Here with you like this. We do this all the time. Talking about exciting things, like how to celebrate the Blessed Mother! What will you be putting on the altar? What is it that you are in need of healing during this cycle of your life? 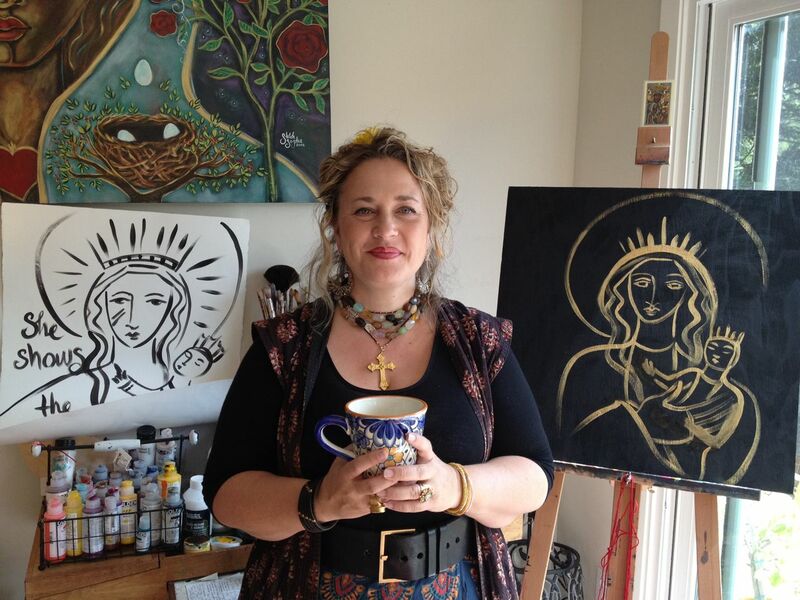 Shiloh will share with you her proven step by step process that works with women of all walks of life and skill experience – in fact there is no painting experience required to create your very own Healing Icon of Our Lady. Take a look at this step by step process that Shiloh teaches, called the Color of Woman Method. We will be passing on many spiritual tools that we use in our 4 days together. One of them is a Medicine Wheel, a between-the-veils compass, a spiritual opening, a physical map, used in many different traditions, and it goes back many, many years, with some that are 5,000 years old which are still in existence in North America. The traditions related to the wheel are endless, rooted in Native American tradition. We are very drawn to the Native American traditions of this land where we live and it is the cross. The earth. The four directions. The elements. The compass of awakening. Waking up often means recognizing that you are in the center of your own sphere of history, ancestry and influence. That there is a domain over which you are responsible and that now that you know about it, it is your sacred work to live from, discover and deepen into it. Are you called? If you feel it, we want you to let us know with your YES. The core of this work will be walking in your own story and healing journey. Many of us need re-mothering and are not able to do this work with our earthly moms for whatever reason. We will work with walking the wheel of the Madonna and the cycles of the moon and how it relates to your life and what you are grappling with as part of the re-mothering journey. Our time will be focused on ritual, creating, prayer, study, circle and connection all within YOUR set intention for healing. We don’t know about you – but even though our lives are really incredible and heading in the direction we want it to go – there is always something in need of healing – it might be from the past – and if we don’t heal it our chance of creating a future that reflects our spiritual path and desires is just less likely. It might be a wound or a missed dream that you know will never come true. This is about YOUR healing. About making yourself available to the beauty that is possible in relationship to the Blessed Mother and the healing power of forgiveness that She birthed on this earth. Her Medicine Wheel is a teaching tool and a creative practice. There is love available. A never ending flow of it. But many of us have a hard time stepping into that flow, receiving it and allowing it to do its work in us. This retreat is about taking time for YOU to re-enter, or perhaps enter for the first time, that experience of entering the Divine flow associated with the Great Lady since it comes from her living water. You do not have to do this world alone – there is help available, but, we have to make ourselves available to it. That is a big part of what our retreat is all about – taking the time to BE with this healing journey in a conscious manner. We will explore the feminine through the lens of the Sophia/Wisdom/Chokmah and Her role throughout History and Humanity, as well as the prophecies regarding both the Blessed Mother and Christ. We will look at the gospels of Jesus from a liberating lens and how almost every single encounter with a woman in the word, broke a taboo, liberated Her and was a restoration of the feminine. We will also connect into the mysteries of the divine feminine, and step behind the veil of the mundane to touch the heart of the mystical inside. This sacred retreat into the embrace of the blessed mother has been called. And now We are calling you! Trying to make a decision? Have tea with us and see if this is right for you. Remember if you would like to talk further about joining us, contact Sarah at sarah@shilohsophiastudios.com to schedule a time to talk. This is a chance to work alongside two women visionaries. Artist and Poet, Shiloh Sophia McCloud and Catalyst and Spiritual Teacher Christine Arylo. These two have been working together every year for 5 years offering at least one sacred retreat a year, this is the 2014 Invitation. Please know women from all spiritual traditions and paths are welcome to join us for this retreat, who have interest in exploring the feminine. 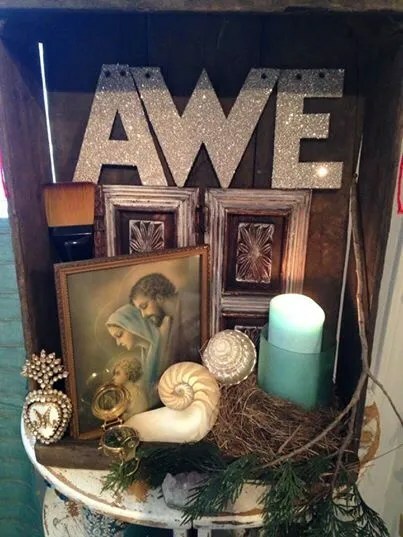 This retreat is focused on painting an Icon of the Blessed Mother and will include scripture inquiry, prayer and some references to Jesus Christ.